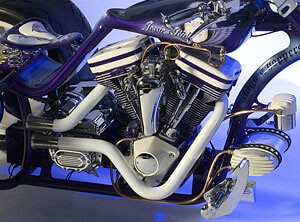 We know that building a great custom bike requires more than just a bunch of sheet metal, two wheels and a drivetrain. Making a great bike requires tending to the details. Killa’ Cycles teamed up and has been working closely with specialty shops (WhitLab LLC., G-Mares and Irving Metal Finish) so we can offer a variety of custom coatings and finishes to make sure that no detail on your custom motorcycle is left unattended. It’s finally here! Now you can do more than chrome those exhaust pipes. We have developed a process of adding color to exhaust using a revolutionary glass coating process, which results in a high sheen finish. We can match colors onto the exhaust for your bike. We can even add graphical designs. Our process of applying a high temperature ground coat inside and out and two or more color coats on the outside will leave your pipes with a durable shiny glass finish.